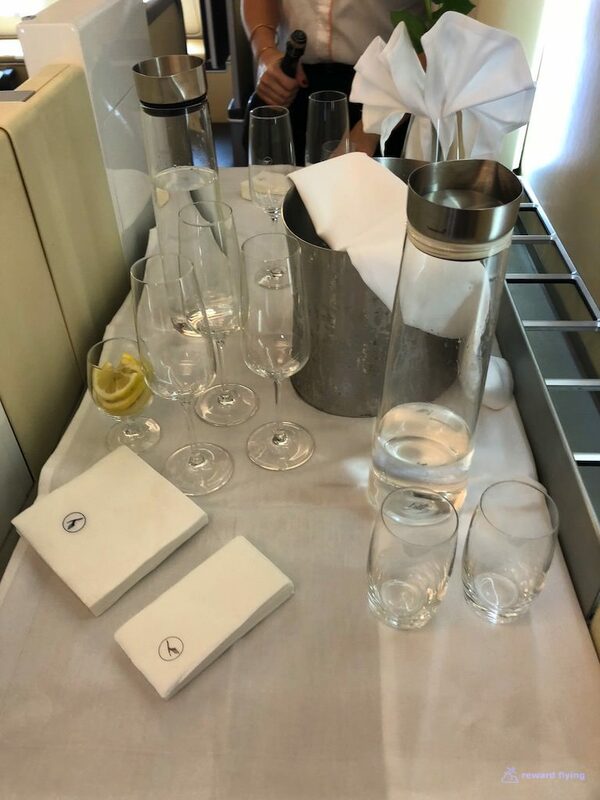 Day three of a four day first class journey back to the states from Australia had me reserved on Lufthansa’s A380 upper deck seat 2K. 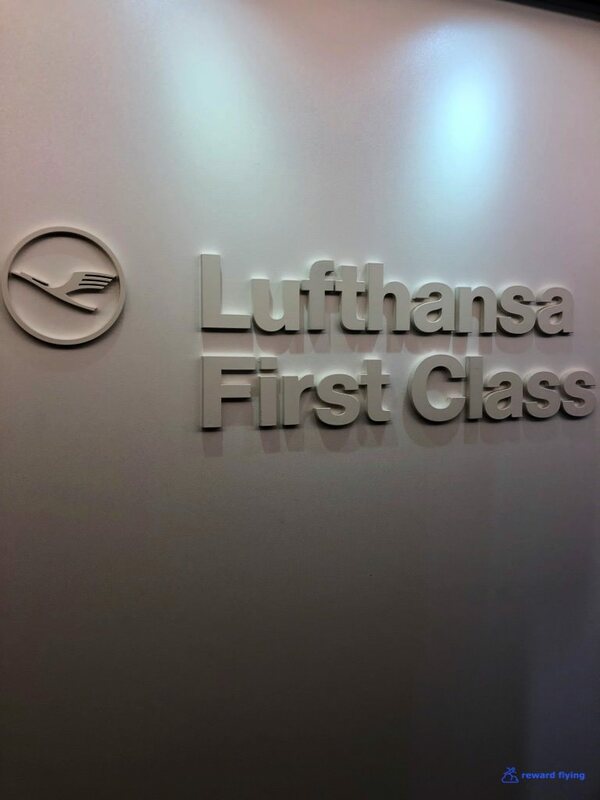 I had booked the four day journey long before Lufthansa released any first class award space. 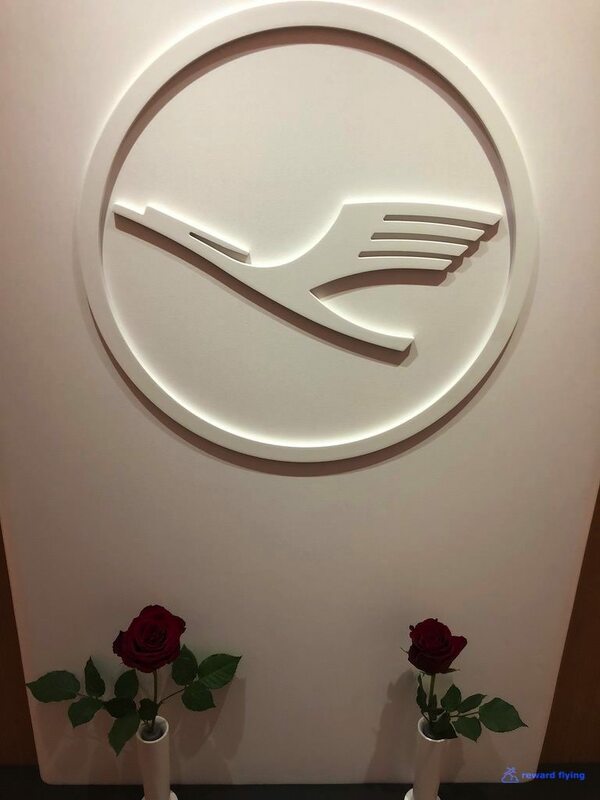 Lufthansa first class award availability can be like clockwork depending on the route. 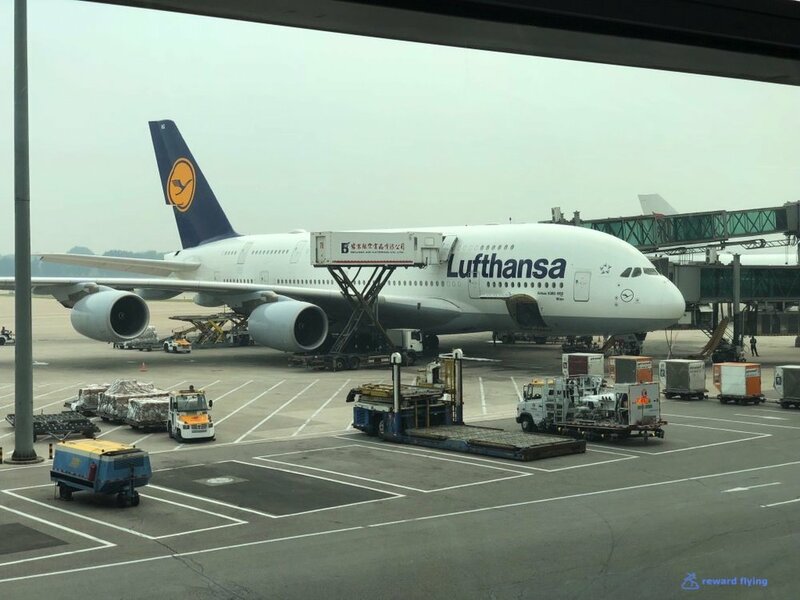 For example ORD-FRA is often, meaning not everyday and better in the summer with two LH flights a day versus one in the winter schedule. PEK-MUC however is for the most part everyday. 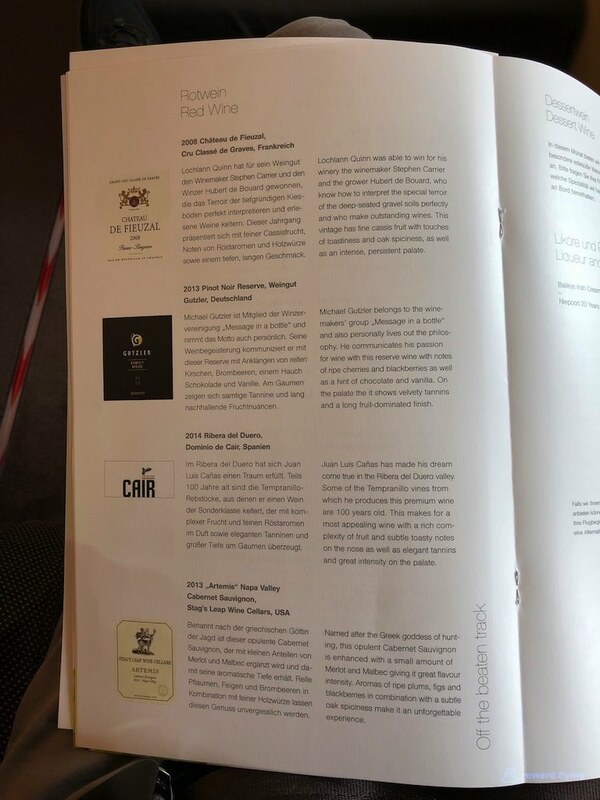 I had reserved Air China’s 747-8i as a placeholder from Beijing to Frankfurt to create the original award ticket. 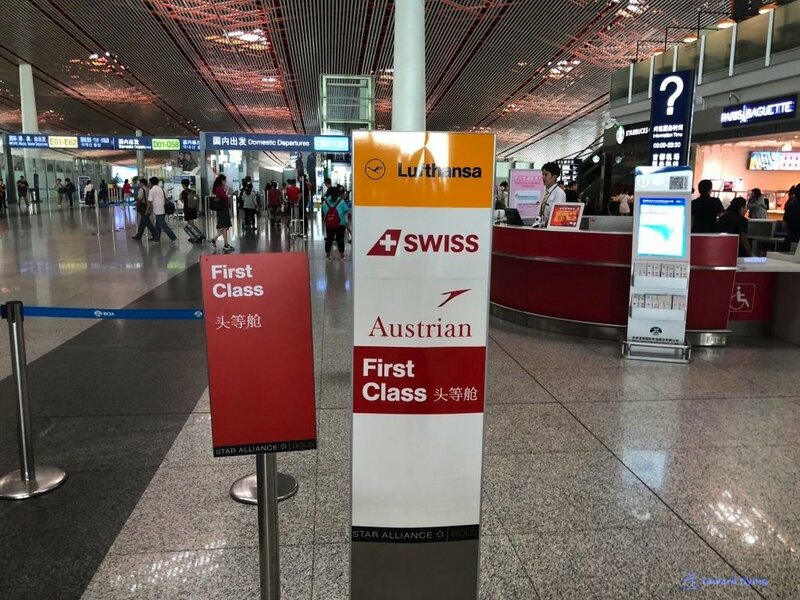 The plan was when LH award space became available, replace CA with LH PEK-MUC, visit the First Class Lounge in Munich then head to Frankfurt to catch Singapore 26 to New York. 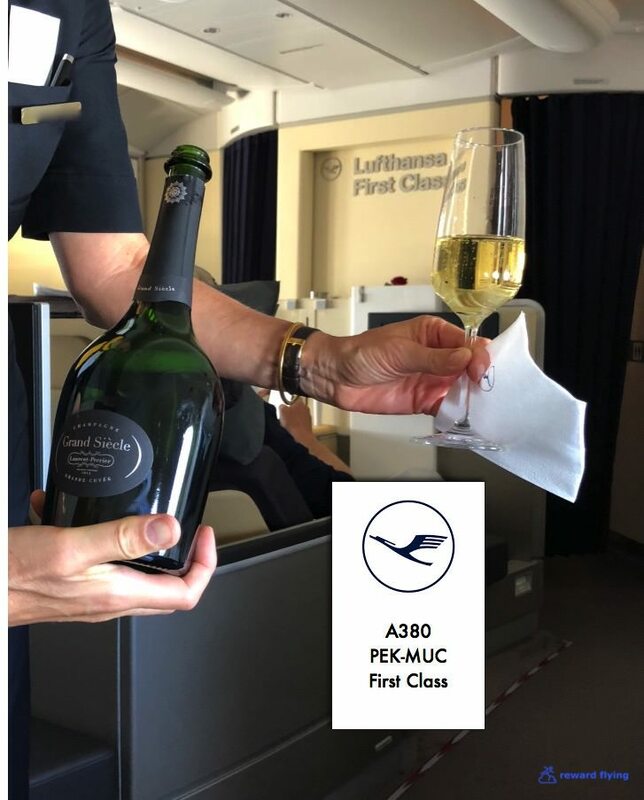 The plan relied solely on PEK-MUC first class award space. I knew the time it would post, 11PM my local time 2 weeks in advance. Everyday for three weeks I checked availability and everyday (except one where it didn’t appear and made me nervous my plan might fail) the seat showed up on time. The day came. I waited until the time, opened the United app to check. Nothing. I kept refreshing the app. Nothing. Then after about an hour it appeared. Within minutes the change was made. 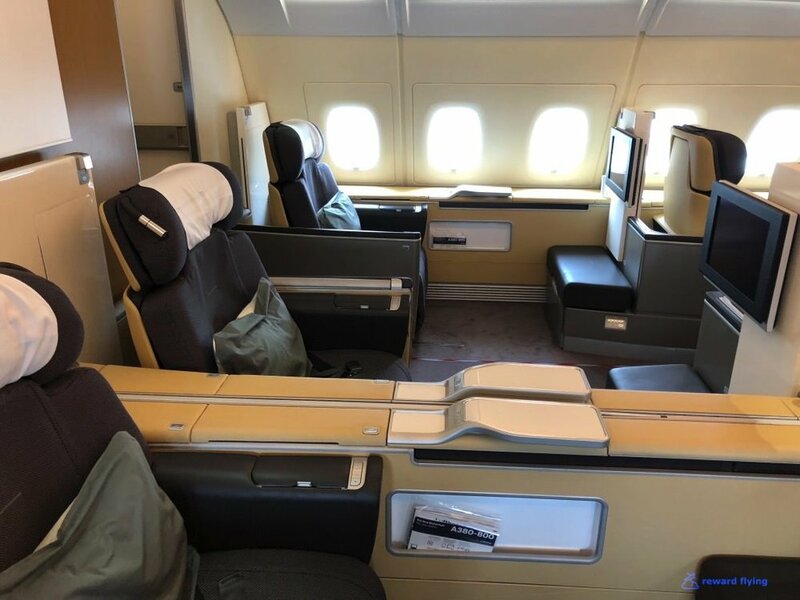 While someday I do want to fly Air China in their B747-8i first class cabin, it will have to wait and it’s pretty well guaranteed that experience won’t be close to this flight. 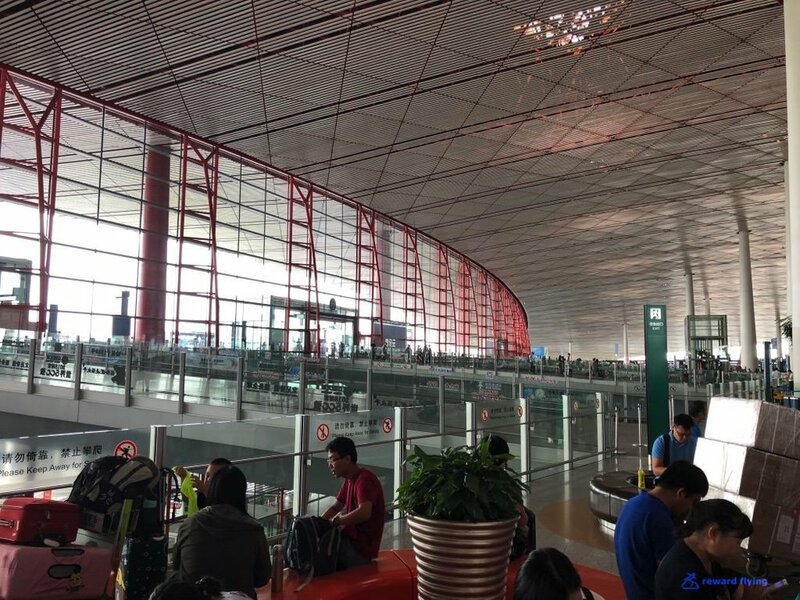 After the train ride to Terminal 3 I had a look around for my seat. Just above the “ft”. There is an escalator in the jetway. 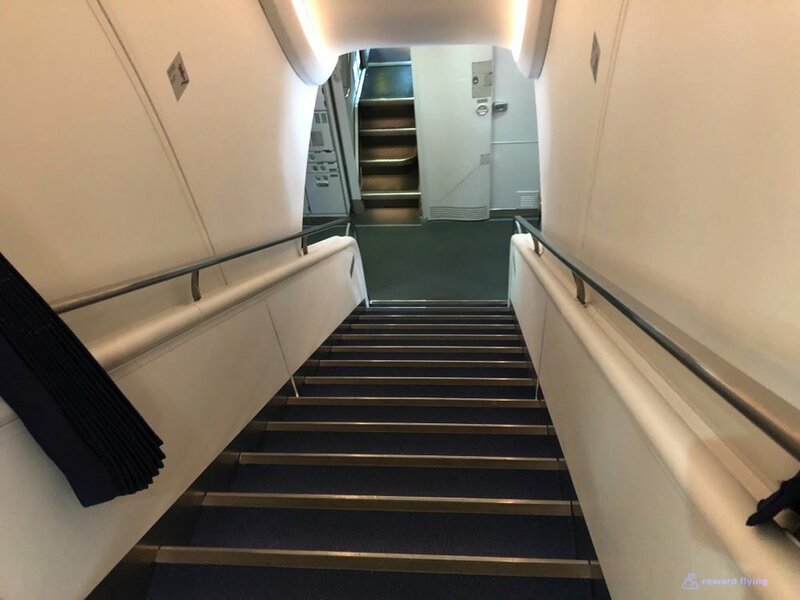 Everyone enters on the lower jetway then premium class takes an escalator up to the upper deck. The many uses of a crane. 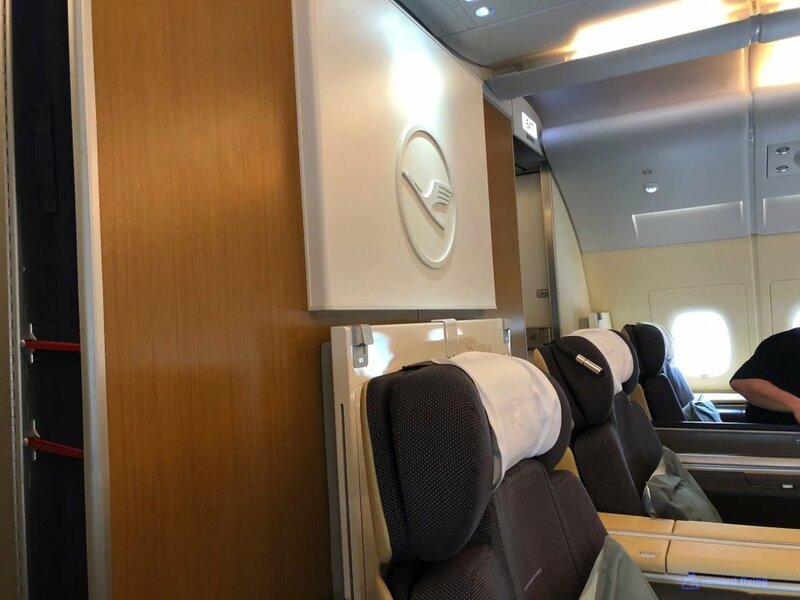 I still maintain Lufthansa has the most beautiful first class cabin, and to me there’s no contest. 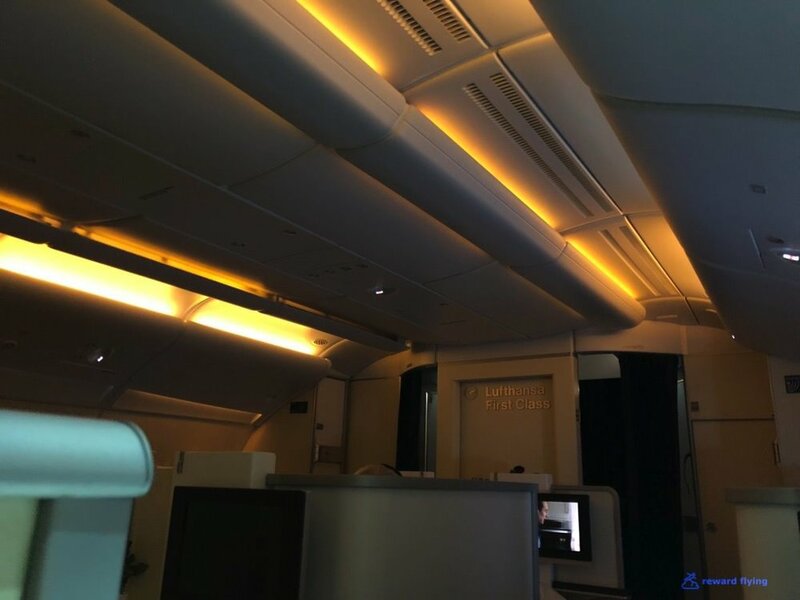 The major difference between the A380 and B747 is on the B747 this serving area on in the middle of the cabin on a small island in full view while on the A380 it’s tucked away between row on and the bulkhead. 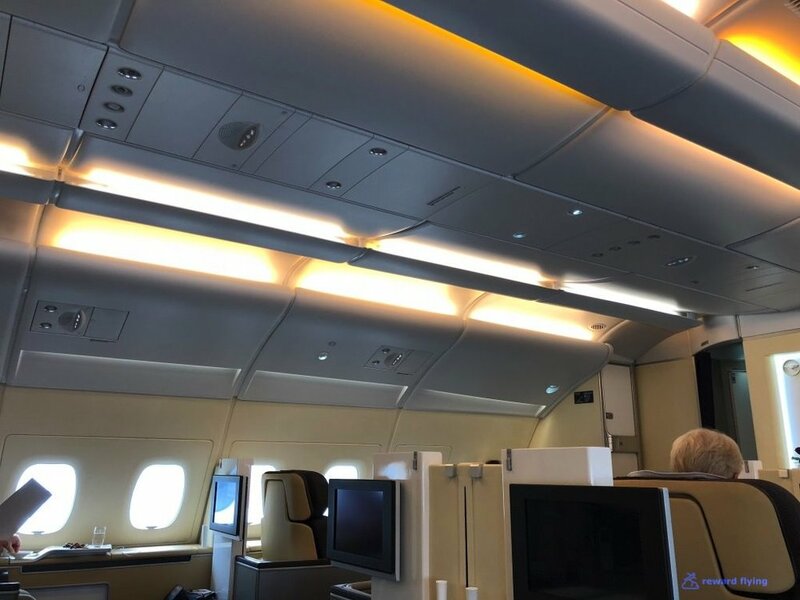 The overhead bins have been removed allowing for an open cabin with high ceilings. Today’s first class load factor is 50%, a couple in row one center seats, and row two windows seats taken by myself and another solo traveler. 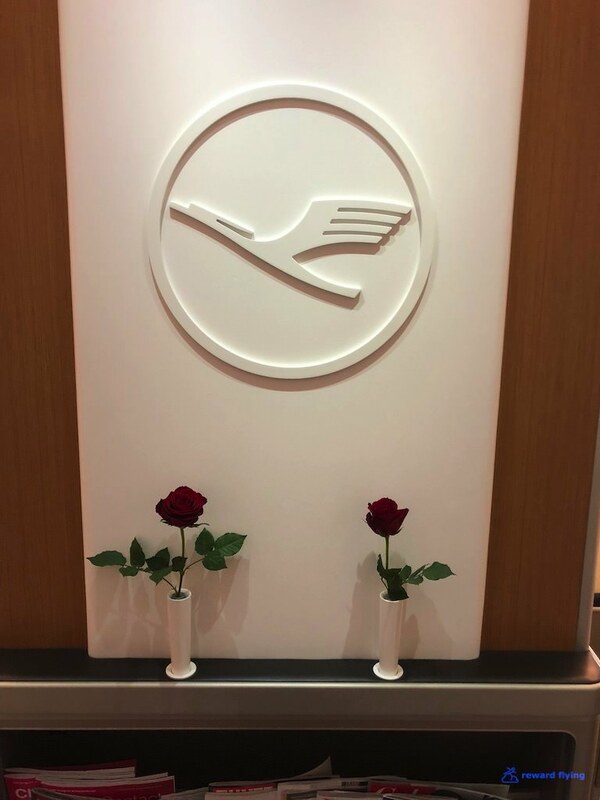 When I first boarded there wasn’t a rose anywhere to be found. I feared a disastrous cutback in the making. But just before the departure my fears were quelled. Can’t image getting tired of this view. Down the stairs up to the cockpit. 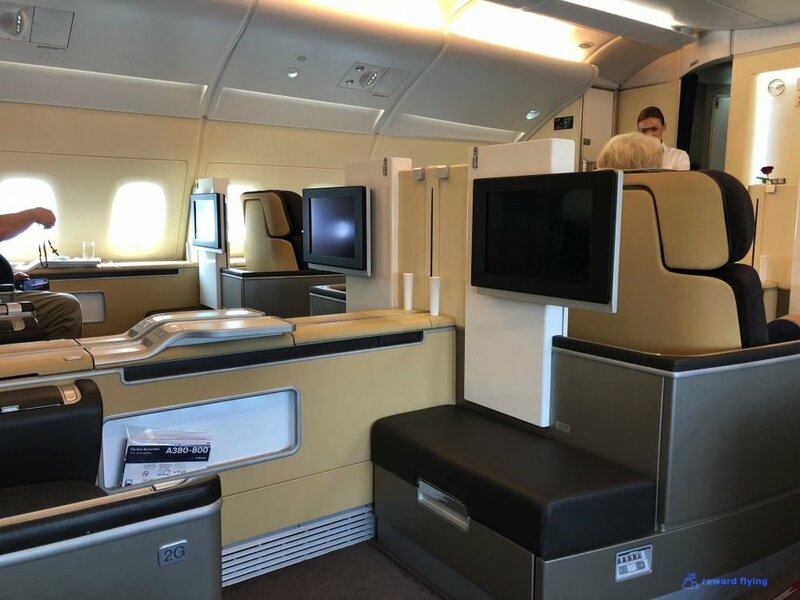 The A380 lavatories are typically huge on the upper deck. 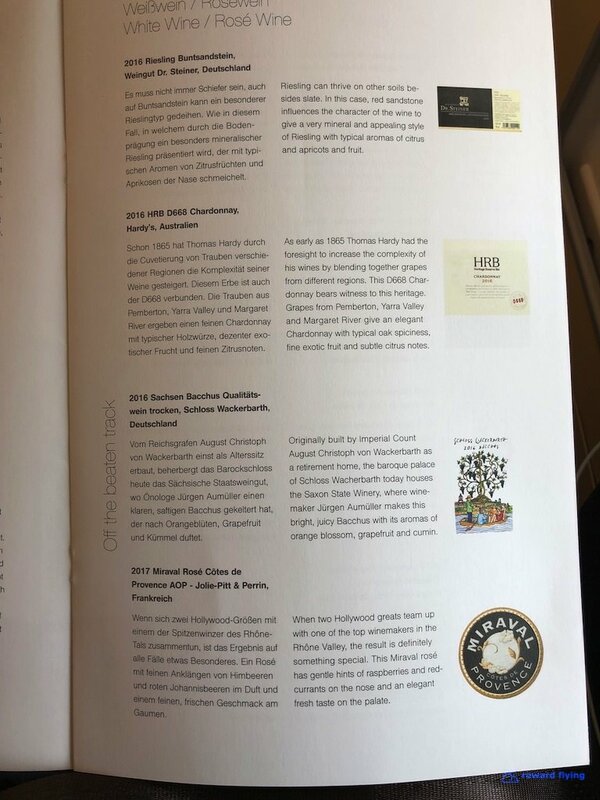 No exception on Lufthansa’s version. And maybe the best aviation invention of all time. Since the cabin was without overhead bins, Lufthansa has storage lockers. However these differ from the 747 lockers as you can lock them, instructions included. Bag stored, 2K upon arrival. The ottoman storage compartment was a perfect fit for my shoulder bag. Armrest controls can move the ottoman to you for a foot rest as well as raise the privacy screen and control various seat positions. Companion dining? They have seat controls as well. Finally a reading light, power controls below the armrest and a bottle of water tucked away behind the seat. With the introductions out of the way, let’s get down to business. Rose water scented oshibori. What? Mixed nuts. Not all macadamia? Well that may be my only disappointment of the day. Plenty of Grand Siecle would be poured at 2K today. While this brand may not be a Dom or Krug in terms of cost, it is a delightful champagne. Maybe you noticed I blurred the FA’s name on her name tag. She was a delightful woman but was adamant about not being in any photo, nor did her tag have her first name, just an initial. While I never take photos of crew I wanted to make sure her name didn’t get out. Other than wanting privacy which is totally understandable, she was an excellent crew member. Before long my FA delivered the Amuse Bouche. I have to say, this morsel was one of the best all time bites of something I’ve ever had. It was a ball of paté covered with a beetroot gelatin along with a crisp toast. Amazing. I choose the tenderloin of beef and requested that it be cooked as little as possible. Well, this request send my FA into stress mode. She explained that the meat came pre-cooked and she had to heat and typically that makes it well done. I said to her I understood, and just do the best she could. The table was set, I guess I didn’t have to mention what I ordered for the appetizer course. Another mini-disappointment if you focus on the garlic bread. Time to switch course. 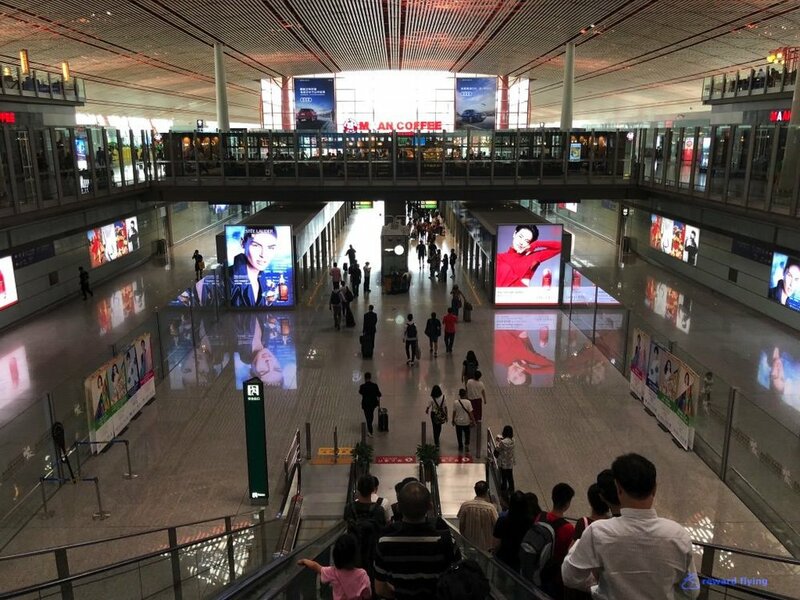 Okay, not on par with Singapore, or even close. But far better than I drink at home. It’s about a $50 bottle of wine. 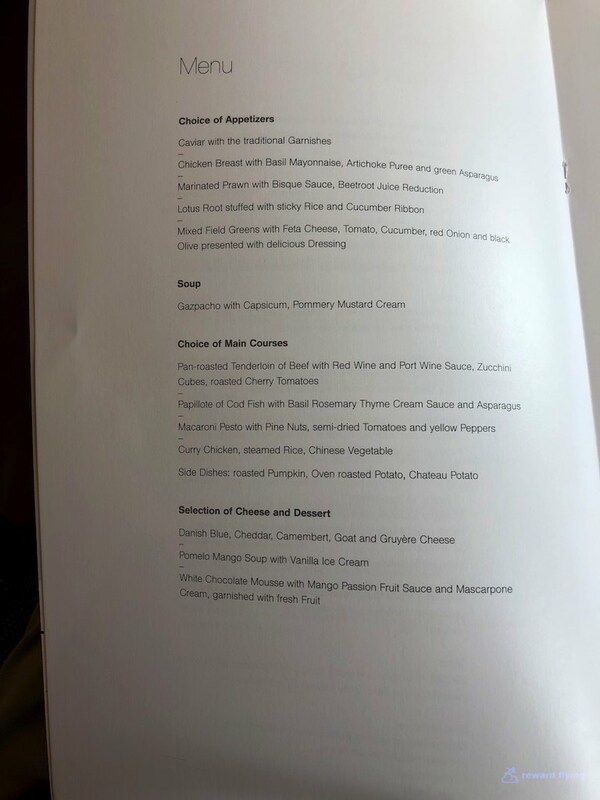 The menu says “choice” of appetizers. Not exactly, it’s ALL appetizers. While everything was delicious, look lower left to find the winner, the chicken breast with basil mayo was mouth watering! A cold gazpacho was next. I’m not a fan of cold soups, but this one had outstanding flavor. As well as a beautiful presentation. And the main course. During the appetizer and soup courses my FA came at least 3 times to tell me she was doing her best to make my steak as rare as possible. I felt bad for even asking her to do this as it was apparent she was extremely worried she would serve it too well done and therefore disappointment me. So how did she do? I’d say pretty darn good! And it tasted pretty darn good as well. This was a fantastic entrée. Stuffed it was time for more. The dessert cart was wheeled out. I opted for the cheese plate. To complete a wonderful meal, chocolates were passed out. I had mentioned cutbacks before noting the missing rose which proved false. But here is another potential serious one. Is it because the flight wasn’t out of Germany or has this changed? I have no explanation for this, but I found the IFE on the A380 to be better than the IFE on a 747. I assume everything is the same. The airshow is the same and not very good on either aircraft, but particularly useless for me in this case. 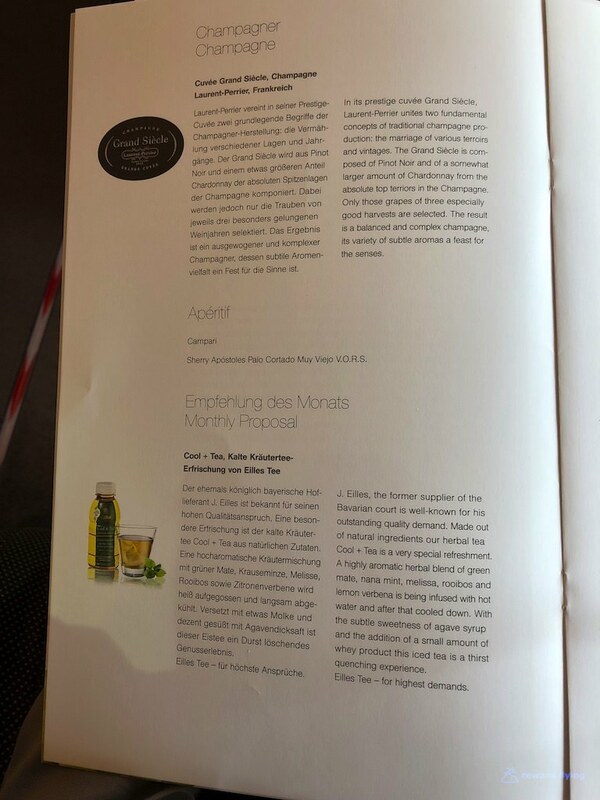 Lufthansa has changed amenity kits for the better. Every so often they also change the style of their pajamas. Maybe it is every year. If so, this year’s color is blue. As I mentioned the cabin crew was excellent. And one of the special gestures in a cabin that is not completely full is to prepare the bed at an adjacent empty seat, rose petals and all. After a few hours of sleep it was time for, well food. Knowing the Munich First Class lounge was a few hundred miles away, I opted for something light and sweet. No mistake was made in this choice. When not sleeping or eating I drank copious amounts of Rooibos tea on ice. FYI: This tea keeps you hydrated. I wish everyone carried it. The dual window shades are so cool on airbus aircraft. And when opened provided a lovely day for flying. But sadly the rural farmlands and small towns east of Munich came too soon. With an A350 landing just after us. 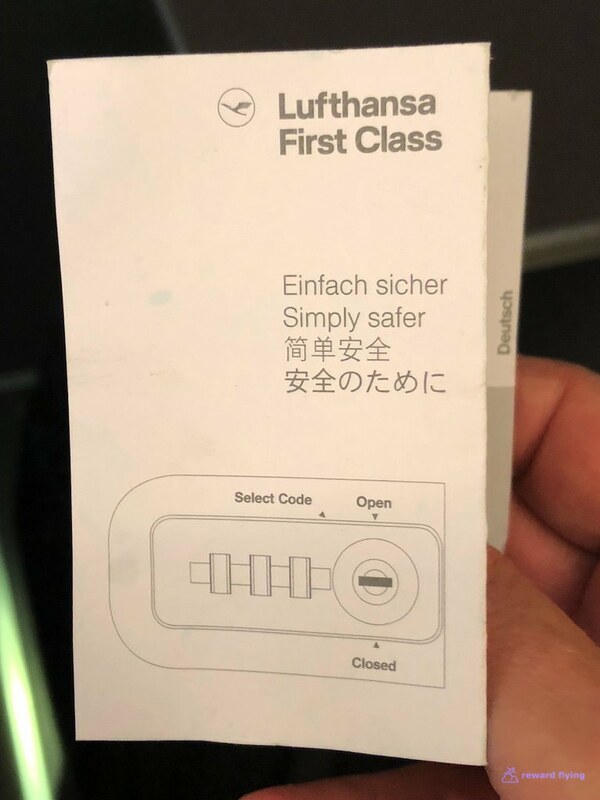 While this ticket was a part of an overall ticket from Australia to the USA, if you flew this PEK-MUC route on its own, the cost would be 147,500 Krisflyer points and about $300 in fuel surcharges. 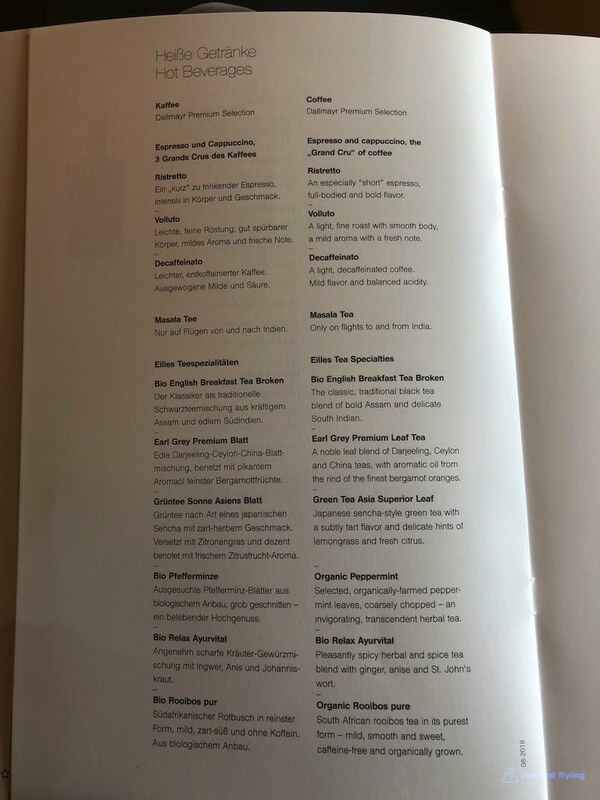 (Lufthansa has recently made changes to these surcharges so it may cost more, much more in the future.) Also use United points without surcharges for 115K points. ✔︎Simply beautiful cabin, and presents itself with more space over the 747 because it’s an even width where the 747 points to nose. ✔︎Very comfortable seat and I found the bed to more comfortable as well. Maybe they’ve changed mattress pads. ✔︎A new amenity kit is an improvement over last year’s Jill Sanders pouch. 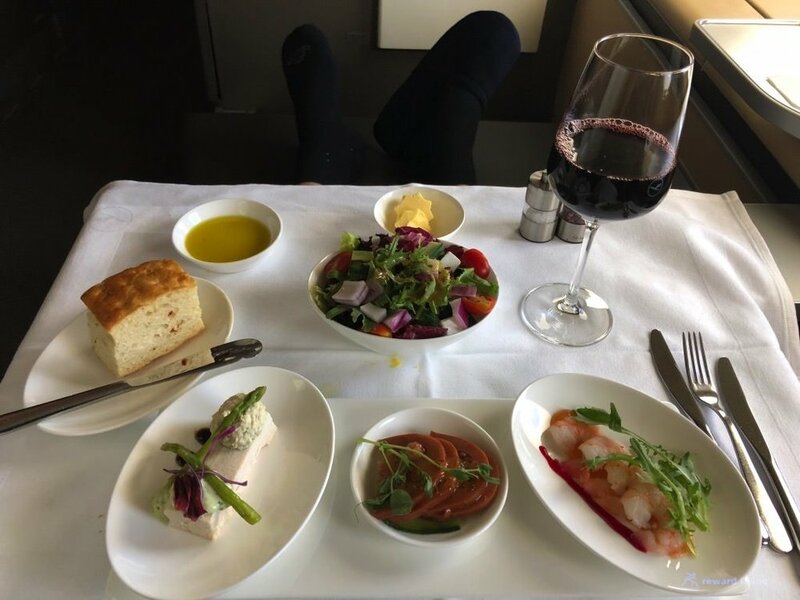 ✔︎Everything I ate on this flight was delicious. ✔︎I found the clarity on these monitors to be better than on the 747. On the other hand I have no reason to believe they are any different. ✔︎ There was wifi on this aircraft however it’s not allowed over China which was better than 50% of the flight. ✔︎Great crew. While maybe not as personal as a Singapore crew, this crew was fabulous. The attention to temperature of main course was much appreciated. ✔︎A380. This aircraft was 8 years old and named Wein. 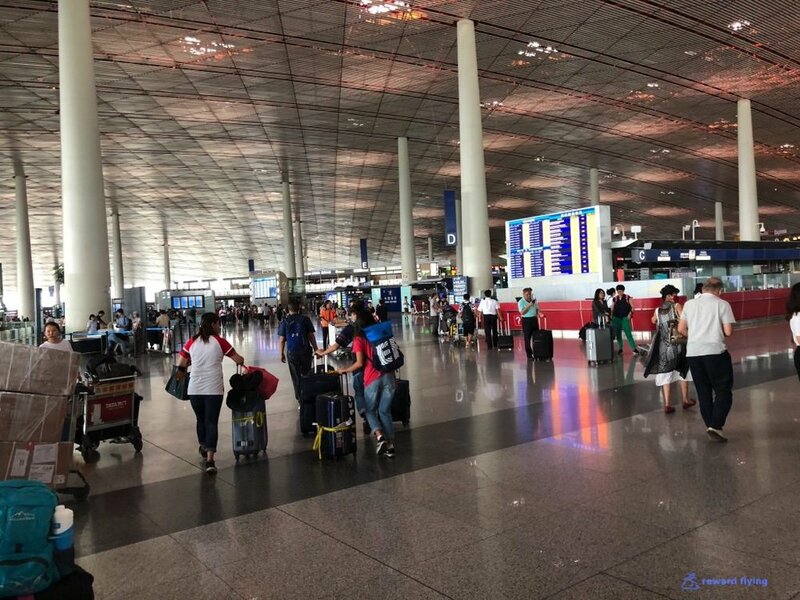 Photos of the Hilton Beijing Airport. I was upgraded to a suite.